On the cover Mammillaria prolifera and its subspecies can be found from Haiti (and possibly Cuba), throughout eastern Mexico, and into southern Texas along the Rio Grande. 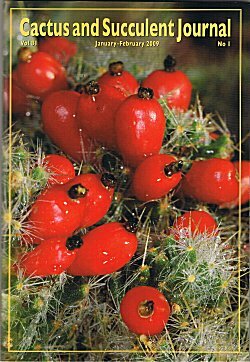 And while it looks like a wintery scene when it appears in fruit on the cover of the January-February issue of the Journal, don't take this as in indication that you should be watering your cacti during their winter rest. This plant's small cream-colored flowers begin to emerge in early spring, and Michael Newberry captured this shot mid-summer following a southern-Arizona monsoon. While flowers and fruits are often present simultaneously, it's fair to say that the fruits are more showy. And like most cactus fruits, they're edible too-tangy, with a seedy crunch. Most people don't bother sewing the seeds, since clumping mamms are so easy to propagate. From a single offset, clumps of heads, each less than 5 cm across, will vigorously fill a shallow 6" pot in a matter of years, ready to be broken up and shared some more.